Deep Dish Taco Pizza - seriously delicious!! A fun twist to taco night. Refrigerated pizza crust topped with refried beans, taco sauce, taco hamburger meat and cheese. Top pizza with your favorite taco toppings!! Everyone loved this pizza and asked to have it again this week! Such an easy weeknight dinner recipe! Pizza plus Tacos equals HEAVEN!!! 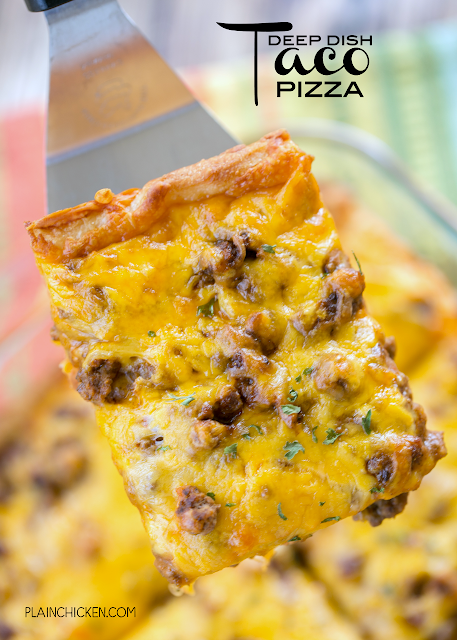 This Deep Dish Taco Pizza combines two of my all-time favorite foods - pizza and tacos!! It is the perfect combination. Pizza dough topped with taco sauce, refried beans, taco meat and cheese. You could even add some onions and peppers too. SO easy and so delicious!!! We both absolutely LOVED this dish. Chicken Legs isn't even a fan of refried beans, but he really, really liked the pizza. I used a can of refrigerated pizza dough. I used the regular pizza dough, not the thin crust. I haven't tried this with homemade pizza dough. If you try this with homemade dough, let me know how it turns out!! We topped our pizza with all of our favorite toppings - sour cream, guacamole, salsa, Whatever you like! 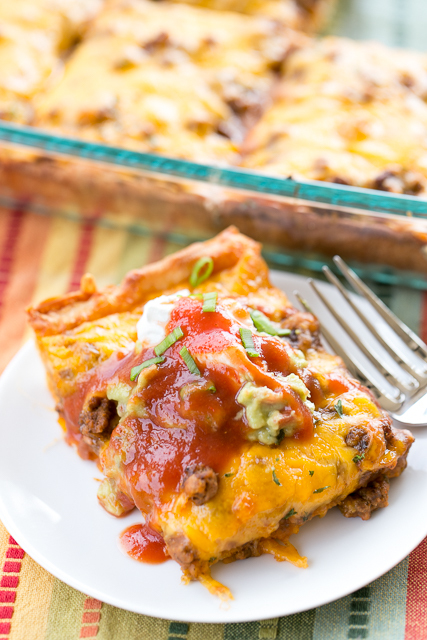 This would be a fun dish your any Cinco de Mayo celebration! Preheat oven to 400ºF. Lightly spray a 9x13-inch pan with cooking spray. Unroll pizza dough and press in the bottom and up sides of prepared pan. 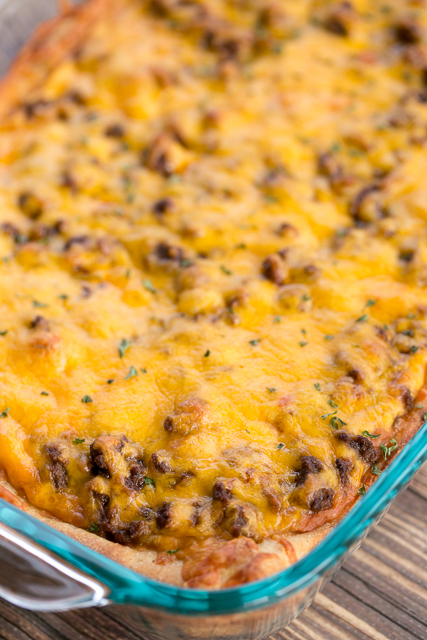 In a skillet, cook ground beef until no longer pink; drain fat. Stir in taco seasoning and water. Cook over medium heat for 5 minutes. Remove from heat. Stir together refried beans and taco sauce. Spread over pizza crust. Top with cooked taco meat. Top meat with shredded cheese. Bake for 15 to 18 minutes, until crust is golden brown and cheese is melted. Top with favorite taco toppings, if desired.